1.Takahashi, R.; Shimano, K.; Okazaki, H.; Kurokawa, T.; Nakajima, T.; Nonoyama, T.; King, D. R.; Gong, J. P., Tough Particle‐Based Double Network Hydrogels for Functional Solid Surface Coatings. Advanced Materials Interfaces 2018,5(23), 1801018. 2.Rao, P.; Sun, T. L.; Chen, L.; Takahashi, R.; Shinohara, G.; Guo, H.; King, D. R.; Kurokawa, T.; Gong, J. P., Tough Hydrogels with Fast, Strong, and Reversible Underwater Adhesion Based on a Multiscale Design. Advanced materials 2018,30(32), e1801884. 3.Matsuda. T.,Kawakami.,R.,Namba.R.,Nakajima.T.*,Gong.J.P. Mechanoresponsive self-growing hydrogels inspired by muscle training. Science 363, 504–508 (2019). 4.Gao, F.; Xu, Z.; Liang, Q.; Liu, B.; Li, H.; Wu, Y.; Zhang, Y.; Lin, Z.; Wu, M.; Ruan, C.; Liu, W., Direct 3D Printing of High Strength Biohybrid Gradient Hydrogel Scaffolds for Efficient Repair of Osteochondral Defect. Advanced Functional Materials 2018,28(13), 1706644. 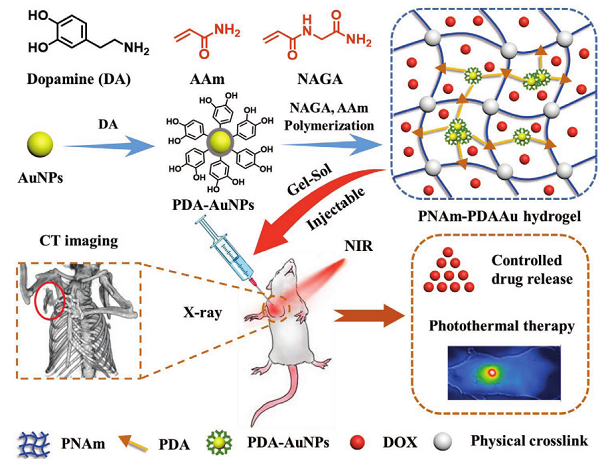 5.Wu, Y.; Wang, H.; Gao, F.; Xu, Z.; Dai, F.; Liu, W., An Injectable Supramolecular Polymer Nanocomposite Hydrogel for Prevention of Breast Cancer Recurrence with Theranostic and Mammoplastic Functions. Advanced Functional Materials 2018,28(21), 1801000. 6.Zhang, Y.; Gao, H.; Wang, H.; Xu, Z.; Chen, X.; Liu, B.; Shi, Y.; Lu, Y.; Wen, L.; Li, Y.; Li, Z.; Men, Y.; Feng, X.; Liu, W., Radiopaque Highly Stiff and Tough Shape Memory Hydrogel Microcoils for Permanent Embolization of Arteries. Advanced Functional Materials 2018,28(9), 1705962. 7.Wang, W.; Tan, B.; Chen, J.; Bao, R.; Zhang, X.; Liang, S.; Shang, Y.; Liang, W.; Cui, Y.; Fan, G.; Jia, H.; Liu, W., An injectable conductive hydrogel encapsulating plasmid DNA-eNOs and ADSCs for treating myocardial infarction. Biomaterials 2018,160, 69-81. 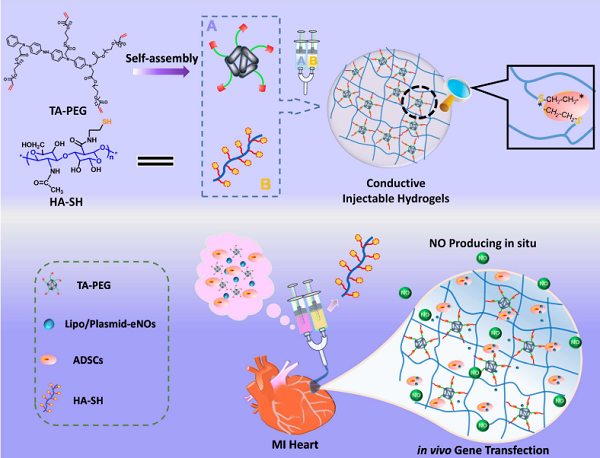 8.Liang, S.; Zhang, Y.; Wang, H.; Xu, Z.; Chen, J.; Bao, R.; Tan, B.; Cui, Y.; Fan, G.; Wang, W.; Wang, W.; Liu, W., Paintable and Rapidly Bondable Conductive Hydrogels as Therapeutic Cardiac Patches. Advanced materials 2018,30(23), e1704235. 9.Zhao, Z.; Zhuo, S.; Fang, R.; Zhang, L.; Zhou, X.; Xu, Y.; Zhang, J.; Dong, Z.; Jiang, L.; Liu, M., Dual-Programmable Shape-Morphing and Self-Healing Organohydrogels Through Orthogonal Supramolecular Heteronetworks. Advanced materials 2018,30(51), e1804435.